Anaerobic Digestion - Hydrolysis Enhancement and Process Improvement! Physical and Mechanical Pre-treatment: chopping, grinding, milling, ultrasound, etc. Physico-chemical and Chemical Pre-treatment: Using chemicals such as alcohols, alkaline, acids, ozone, etc. Thermal Pre-treatment: Using heat and hot water. Biological and Enzymatic Pre-treatment: Using specialized microorganisms and specific enzyme treatment to the feed. Physical/Mechanical pre-treatments are mainly consisting of chopping, grinding, milling, ultrasound, microwave irradiation etc. (Taherzadeh et al, 2008; Shahriari et al, 2012) to reduce the overall particle size of the feedstocks. 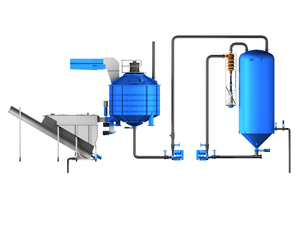 Mechanical pre-treatment of feedstocks provides advantages like higher exposed surface area of feed resulting in higher microbial access and degradation; increased cell rapture and release of organics in the solution resulting in better biodegradability and higher gas production. Physico-chemical or chemical pre-treatment consist of steam explosion, application of alkaline solutions such as NaOH, Ca(OH)2 (lime) or ammonia, treatment with ozone, treatment with acid such as dilute sulphuric acid, acetic acid and nitric acid etc (Taherzadeh et al, 2008). The aim of the chemical pre-treatment is to break down the complex organic compounds to simpler structures that are more hydrolysable during the digestion process. In thermal pre-treatment feedstocks are subjected to a higher temperature in the range of 40-150 0C (Müller, 2000) to accelerate the hydrolysis process by breaking down the long chain bio-molecules. Liu et al (2012) suggested that thermal pre-treatment at 175 0C for 60 min significantly decreases viscosity, improves the dewatering performance, as well as increases soluble chemical oxygen demand, soluble sugar, soluble protein, and especially organic compounds for municipal biomass wastes. In addition, by thermal pre-treatment 59.7%, 58.5% and 25.2% of the organic compounds can be separated in the liquid phase from kitchen waste, vegetable/fruit residue and waste activated sludge respectively. Moreover, waste activated sludge achieves a 34.8% methane potential increase and a doubled methane production rate after thermal pre-treatment. Cambi Thermal Hydrolysis Process (www.cambi.no) is an example of thermal pre-treatment technology. Specialized microorganism or specific enzymes have also been used to enhance hydrolysis of the feedstocks. Enzymes such as lipases, proteinases, cellulases and hydrolases have been reported to to accelerate hydrolysis in the literature (Dohányos et al., 2004; Mshandete et al., 2005; Schieder et al., 2000). Several fungi, such as brown, white and soft-rot fungi, have been used for pre-treatment of lignocellulosic feedstocks and white-rot fungi are reported to be the most effective microorganisms for lignocelluloses (Sun et al, 2002). The main advantages of biological pre-treatments are lower energy requirement, no chemical requirement and mild environmental conditions; but for most biological pre-treatment processes the treatment rate is very low (Taherzadeh et al, 2008). Dohányos, M. Zábranská, Kutil, J. and Jeníček, P. (2004); Improvement of Anaerobic Digestion of Sludge, Water Science and Technology, 49 (10), 89-96. Liu, X., Wang, W., Gao, X., Zhou, Y., Shen, R. (2012); Effect of Thermal Pre-treatment on The Physical and Chemical Properties of Municipal Biomass Waste, , 32(2):249-55. Mshandete, A., Björnsson, L., Kivaisi, A.K., Rubindamayugi, S.T. and Mattiasson, Bo. (2005); Enhancement of Anaerobic Batch Digestion of Sisal Pulp Waste by Mesophilic Anaerobic Pre-Treatment. Water Research 39, 1569-1575. Müller, J.A. (2000); Pre-Treatment Processes for the Recycling and Reuse of Sewage Sludge. Water Science and Technology 42 (9), 167-174. Schieder, D., Schneider, R. and Bischof, F., (2000); Thermal Hydrolysis (TDH) as a Pre-Treatment Method for the Digestion of Organic Waste. Water Science and Technology, 41 (3), 181-187. Shahriari, H., Warith, M., Hamoda, M., Kennedy, K.J. (2011); Anaerobic Digestion of Organic Fraction of Municipal Solid Waste Combining Two Pretreatment Modalities, High Temperature Microwave and Hydrogen Peroxide. Journal of Waste Management, 32 (2012) 41-52. Sun, Y., Cheng, J. (2002); Hydrolysis of Lignocellulosic Materials for Ethanol Production: A Review, Bioresource Technol., 83:1–11. Taherzadeh, M. And Karimi, K. (2008); Pretreatment of Lignocellulosic Wastes to Improve Ethanol and Biogas Production: A Review, Int J Mol Sci. Sep 2008; 9(9): 1621–1651. Go Back to the Anaerobic Digestion Pre-treatment Home! Go Back to the Anaerobic Digestion Waste Home!